Tag Archive | "Bogota Declaration"
In late 1976, eight “States traversed by the Equator” convened in Bogotá, Colombia to discuss their rights over a natural resource which—to them—had been unfairly removed from their sovereignty. Specifically, these states felt that their rights to control natural resources had been unfairly abridged by Article II of the 1967 Outer Space Treaty, which cements the rule that “outer space, including the moon and other celestial bodies, is not subject to national appropriation.” At the conclusion of the conference, Colombia, Ecuador, Congo, Indonesia, Kenya, Uganda, and Zaire, with Brazil as an observer, proclaimed the Bogotá Declaration to assert their rights. To get around the Outer Space Treaty’s declaration that outer space is not subject to national appropriation, the Bogotá Declaration categorized the geostationary orbit (“GEO”) as a natural resource, not a region of space. Indeed, the Declaration claimed that the unique properties of GEO are created by the Earth itself. By categorizing this orbit as a resource, these states could call on the jus cogens principle that states have absolute control over their natural resources. Given the unique characteristics of the GEO, this is not an outrageous proposition. Geostationary orbit is a band 36,000 kilometers above Earth’s equator where a satellite orbits the Earth at the same speed the Earth rotates. Therefore, a satellite in GEO stays over a fix point on the Earth’s surface. Satellites in GEO are why you have satellite TV and some of the large scale weather pictures. If an equatorial state’s borders were projected into the heavens, a satellite situated on a degree of longitude within that state would never pass outside its borders. Traditional problems of superjacent flyovers of a state’s territory are subsequently nonexistent. In fact, Principle 3(c) of the Declaration specifically recognizes the right to superjacent transit. Rather, the Declaration is concerned solely with GEO. Underlying the argument that sections of GEO are within an equatorial state’s sovereignty is the value of satellite positions in GEO. Geostationary orbit is a scarce resource. Because there are only 360 degrees of orbit can be used, and satellites must be several degrees apart to avoid interference, satellite positions—called “orbital slots”—in GEO are limited. Furthermore, sections that cover landmasses are particularly valuable. Equatorial states, consequently, have a large incentive to argue that they control sections of GEO. Ultimately, however, the Bogotá Declaration is precluded by public international law. Article II of the Outer Space Treaty has passed into customary international law; consequently, adopting the Declaration’s view on GEO would contravene well established limits on state sovereignty. As early as the 1910s, legal scholars contemplated a vertical limit to a state’s territory. Indeed, the free use and non-appropriation of outer space, through over sixty years of state practice, is enshrined in public international law. Furthermore, because GEO is so important for communication and navigation, it is impractical to revert to a state-sovereignty based allocation regime. 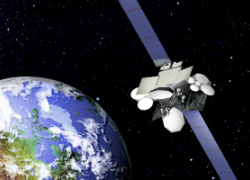 Despite the valid concerns in the Bogotá Declaration, there are two safeguards that should protect developing states’ interest: (1) the Committee on the Peaceful Uses of Outer Space (COPUOS) operates on consensus and (2) the International Telecommunication Union (ITU) is charged to efficiently allocate spectrum in geostationary orbit. The Outer Space Treaty was drafted in COPUOS’s Legal Subcommittee and is product of many years of compromise and negotiation. Because COPUOS operates by consensus, any agreement that it issues has been worked so that it is acceptable to all parties. Regardless of whether all are actively in favor of the agreement, there are at least no active opponents. Consequently, the treaty—including Article II’s non-appropriation clause—garnered substantial support from states involved with its drafting. In addition, the ITU parcels out orbital slots in GEO with an eye toward the “efficient use” of the limited space. Although it is certainly an imperfect system, developing states have an equal opportunity to request and use section of geostationary orbit. While the ITU’s “efficient allocation” does not necessarily allocate the orbit in a way that “benefits all countries,” developing states at least have an equal opportunity to use the geostationary orbit. So while the debate over whether GEO is a natural resource subject to national appropriation is certainly dead, this debate does beg the question of how space resources should be used when, for example, we start mining asteroids. Dan St. John is a third year law student at the University of Denver, the EIC of The View From Above, and the Founding President of DU’s Space Law Society.